An injured puppy has had an eventful start to life in an adventure that began when he saw a passing cyclist. 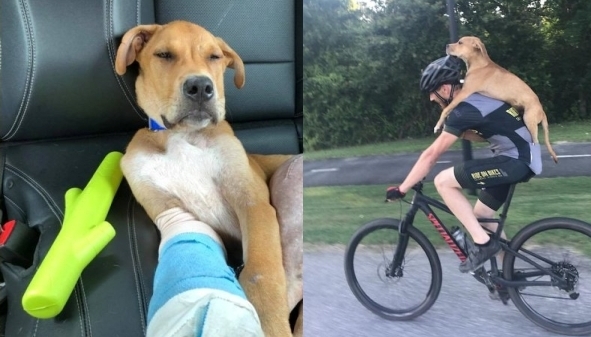 Mountain biker Jarrett Little was riding with a group of friends when he spotted a stray dog that had been hit by a car. The only transport available was the bike, meaning the injured dog had to cling on to Jarrett for dear life. When they got into town, they ran into a businesswoman from the other side of the US. Andrea Shaw was visiting from Maine but the pup took one look at her and ‘ran right to her as though he knew she was his next step.’ She told Metro.co.uk: ‘We just happened to be standing in front of the bike shop where an organised ride leaves from on Tuesday nights – so Jarrett pulled up with Bo on his back. The vet found that Bo had a serious case of road rash, as well as several fractures in his leg and a broken toe. 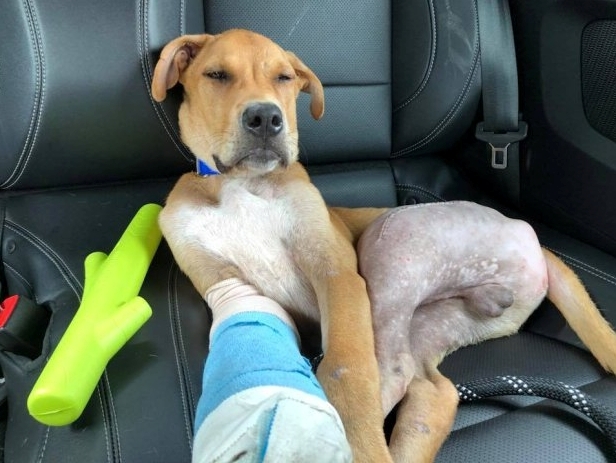 He went to an orthopedic vet the next day for surgery and was soon on a Grateful Doggies transport van for the 1,500 mile trip back to his new home in Maine. Bo made the trip with 25 staples in his hind leg and four pins to stabilise the fractures, as well as a full cast on his front leg to help the broken toe. He took medication during the journey and the drivers had to stop once after an upset stomach led to a few unpleasant side effects. 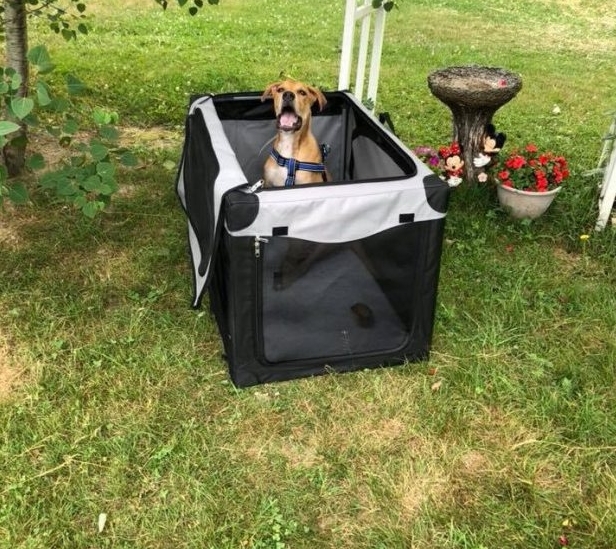 Andrea says it only took Bo about five minutes to get used to his new home in Maine – where Andrea already had two other rescue dogs and some horses and a human brother for Bo, Christopher. 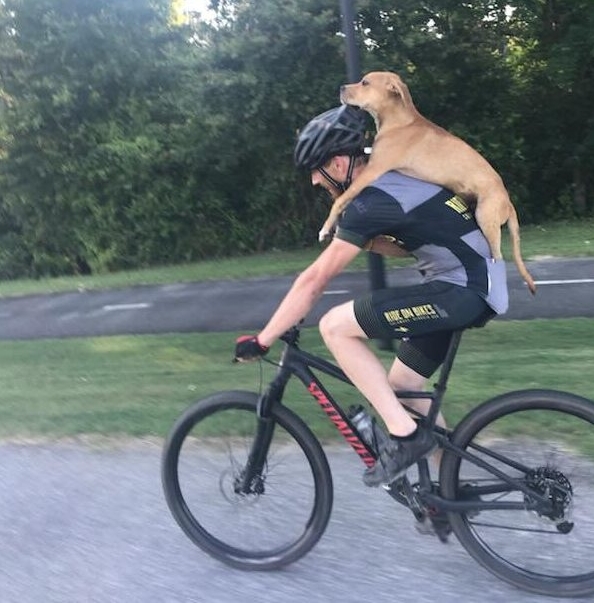 Responses to "Injured stray puppy hitches ride into town on man’s back"